Argueing with people in order to change their mind is the road to an early heart attack, argue to reveal the flaws in their argument and assume a reasonably intelligent interested reader. We could easily come up with a list of people that will never change their minds and will shamelessly promote “Cooling since 2013”, “Arctic Ice highest since 2012” claims when the time comes. What’s important is not letting such things sit out in the open unchallenged where the unwary might trip and get covered in stupid. I think that people who happen by those websites will only stay if they are inclined to reject the science. Those who see the sites for what they are leave pretty quickly. The ones who stay are the ones who get their pre-existing biases confirmed by what McIntyre, Watts and Curry write. It’s true that you can put a reasoned argument out there for those who might be open to it, but as Peter Watts wrote in the excerpt I quoted in my previous post, people are adept at denying the facts when they contradict their current opinions. I doubt there are many in those audiences who are truly open to facts and evidence that may contradict their views. I just don’t see much movement taking place among the denizens of those chum-pits. Those who try are certainly appreciated by the rest of us, but other than being valiant, they are probably wasting their pixels and neurons. People who’ve been reading regularly for more than six months are either buying into what’s there or know better and are reading for popcorn munching entertainment value. People that are new to the issue don’t know any better. Maybe they googled something or read a news article that made them angry or want to find out more. What you don’t want to is to lose reasonable open minded people because they read a site like WUWT for two weeks and never saw the stuff there challenged in any way. You’d hope they’d find somewhere like skepticalscience but there’s no guarantee plus by the time knowledgeable people get to debunk things they’ve moved onto the next faux outrage. Luckily most people are not like this. I suspect the climate issue will remain in stalemate until the next global temperature record and the next summer heatwave affecting Western countries. Human psychology is what it is. I tend to agree with sharperoo; it’s not just WUWT and the usual abode of the stupid, it’s also the endless stream of articles and blog threads on local newspapers and such. Like sharperoo, I can’t let total stupid just lie there unchallenged. It’s like a dog turd–the neighborly thing to do is to pick it up (carefully) and dispose of it. Then put up a sign “please don’t leave turds here”. I applaud the resolution anyway. Oh, and you should read whatever you have not read from Junior, because that’s what you would have needed to read to be able to criticize his position, and which you will therefore most certainly misrepresent. WP’s new connecting hook is not to my liking. Been there done that, right? One more thing coming to mind: Junior features on the Heartland Institute’s list of resident climate experts. Not anything folks I socialize with would want on their CV, and, knowing the Heartlanders, plausibly beyond Junior’s control. But. It suggests that *clarity* may be an even more urgently desirable character trait for him than *honesty*. Mark Twain also said “Life does not consist mainly, or even largely, of facts and happenings. It consists mainly of the storm of thought that is forever flowing through one’s head.”. I’d say that “consensus” is effectively suppressing that “storm of thought” and replacing it with “defending your position”. “Contracted out.” Huh. I think of it as being able to learn from the experiences and knowledge of others, without having to reinvent the wheel myself. Your premise alone — about arguing with “stupid” people — shows conclusively that you are not up to the task of arguing “on the merits”. You have conveniently pre-judged your case thusly: “I am right, and if you disagree, you are stupid”. Imagine a prosecutor or defense lawyer going before a court and saying that. DO YOU REALIZE WHAT HAPPENS TO ATTORNEYS WHO TRY THAT???????????????? Back when high schools taught critical reasoning, this sort of nonsense would not have passed muster with the Debating Team. Today we have millions of dumb-asses who cannot make and defend a proposition without having to revert to the ad hominem. Oh, wah wah — did I include you in the ‘stupid people’ category because you are a regular at WTFIUWT and now you’re all insulted? 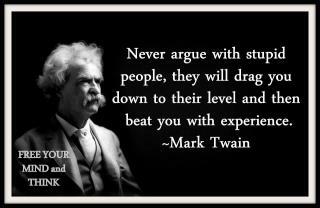 Stupid people can’t recognize merits of arguments, so there’s no use presenting them. It’s an exercise in futility. Read the research on D-K.
There’s no merit at WUWT other than as part of an archaeology of knowledge. It’s just a lot of chum designed to draw sharks and pad the hit counter. Anyone who reads there to find their climate science news is stupid at worst, ignorant at best. If the shoe fits, you’re Cinderella. Policy Lass thinks that argumentum ad hominen is a valid, indeed devastating, logical argument. If that’s all she’s got, you and I have nothing to worry about. As well as stupid, she can also call me a heretic and an infidel and an unbeliever. I love it. As to her scientific argument, she appears to have none – much like the Catholic Church vs Galileo, Copernicus etc. Now let’s consider the Laws of Thermodynamics vs Greenhouse Theory . One is correct, the other not. It is impossible for both to be. Pick your corner. It appears to actual physicists that the Laws of Thermodynamics and Greenhouse Theory are firmly on the same side. Those placing it on opposite sides are even scolded by Fred Singer and Roy Spencer. Which should tell you something, if you were not such a prime example of the Dunning-Kruger effect. Even Roy Spencer would call that dumber than a sack of spanners (but not in those actual words, I’m sure). The statement after this is a lie. The statement before this is true. In a word, nonsense. Go back and check with a real scientist. You just grabbed something that sounded clever and stated it as fact, but actually it’s quite stupid. Thermodynamics and global climate change due to heat trapping greenhouse gases are correct, but Crisp is hardly so. Attention, Anna. you just used an ad hominem attack while simultaneously insulting the idea of an ad hominem attack. Reductio Absurdum. Is it your view that those who agree that carbon dioxide is a greenhouse gas which probably leads to atmospheric warming on the order of 1 C per doubling of its atmospheric concentration but find that there is no convincing evidence for large positive feedbacks are either stupid or ignorant? If so, then you should be aware that your broad stroke includes Richard Lindzen, Roy Spencer, Freeman Dyson, William Happer,… . Lindzen, Spencer, Dyson, etc. are far from stupid. It’s the people who swallow their bilge that are stupid. So these “far from stupid” people are spewing “bilge”? Could you be more explicit? Exactly what particular scientific points do you characterize as “bilge”? No, on second thought, don’t bother. This is a pig-wrestle-free zone. I see now that you “can beat [me] by experience”. When you demonstrate the ability to employ a principled argument, I’ll rejoin the fray. In case you have poor reading comprehension, my post was basically saying that I’ve given up trying to reason with or argue with so-called ‘skeptics’ because I’ve realized they aren’t honest skeptics, but stupid people. At this point in time, people who still claim the mantle of ‘climate skeptic’ are not real skeptics and probably don’t even understand what the word means. Those who still hold themselves out as climate skeptics at this point in time and considering the overwhelming evidence of anthropogenic climate change are one of three types — venal deniers out for personal gain, ideologues keeping their cherished ideology intact (read – libertarian extremists), and teh stupid. There is no chance in hell of a “principled argument’ with any of them, so don’t hold your breath on me trying. When I do speak about the issue, I know I’m only speaking to those who already understand. yes, quite a gallery of wannabe climate scientist misfits with mud in their eyes. bullseye! As I said, you would not survive a day in a courtroom. Make that a second, an instant.. I suspect you’ve nver had a math, science or logic course in your life. My take is, you tried making a case at WUNT or other sites, and got your ancephalous “head” handed to you. It is YOU who, faced with the impending DEATH of your raison d’tre, have moved to DENIAL, and from there to ANGER. If I USE enough CAPS in my POST will I look STUPID or RILLY SMART AND FORCEFUL??????????????????? The fact you characterize the tripe posted at WUWT as “solid evidence against AGW” rather proves my point. MUST NOT WRESTLE WITH THE PIG!!! Global warming? Don’t wait up. Perhaps it’s comforting to believe that science is an absolute discipline: immune from fads, fanatics and frauds, untroubled by extremists, evangelists, glory-seekers and bigots. But it is not. It is as vulnerable to the vested interests and biases of its practitioners as any corporate entity or political party. Uncomfortable truths are suppressed and dubious evidence given undue prominence. Nowhere is this more worryingly obvious than in the science of climate change. As a field of research it has become so heavily politicised that opposing views are spoken of in terms of religion: believers and non-believers, with the accent being on the righteousness of the former and the benighted state of the latter. Those who believed scientists to be relentless seekers of the truth will have been shocked by the row sparked by a hacker (or was it a leaker) who got hold of emails sent by staff at the University of East Anglia. It has been claimed that the emails exchanged by members of the university’s Climate Research Unit showed statistics had been finessed using ‘tricks’ and material that didn’t fit the computer model of Climate Change presented to the Intergovernmental Panel on Climate Change (IPCC) was allegedly suppressed. Those that hinted at the existence of this sort of activity and were pilloried by people who have everything to gain from keeping the climate-change gravy train rolling. Because that is what it has become. Sensationalist theories are generated by scientists who have evolved into professional alarmists who can influence the IPCC and reap rewards in research grants and fame. The trouble is that the only way to protect this position – and transmit their message of doom and gloom – is for the little coterie of climate comrades in the UK and United States to ignore geology, archaeology, history, astronomy and solar science. You see, these are all the things that don’t fit. The reality is that the Earth has been here before, it has been here through worse and it is still, resolutely, here today. Climate-change theory and the dire prognosis given by its proponents is just wrong. Look at the facts. Earth is a warm, wet, greenhouse planet. There has been ice on its surface for less than 20% of its history, and in the geological past there have been six great ice ages. Two ice ages were characterised by ice at the Equator, with sea levels rising by up to 5,000ft. That’s sea-level change! Five of the ice ages saw a far higher atmospheric carbon-dioxide content than at present. So carbon dioxide could not have caused past climate changes. Indeed, early Earth had 1,000 times more carbon dioxide in the atmosphere than now – yet there was no runaway “greenhouse” effect, “tipping points” or “acid oceans”. The initial source of the two main greenhouse gases, water vapour and carbon dioxide, was volcanoes. Water vapour is still the main greenhouse gas. Once oceans formed and life appeared, carbon was then recycled between the oceans, atmosphere, soils, life and rocks. Carbon dioxide is a plant food, not a pollutant. Human activity produces only 3% of the world’s carbon-dioxide emissions each year. One volcanic belch can emit as much as that in a day. Carbon dioxide has a short life in the atmosphere and is absorbed by natural processes that have been taking place for billions of years. At the normal past rates of absorption, even if we burned all fossil fuels on Earth, the atmospheric carbon-dioxide content would not double. In past ages it has been naturally absorbed into everything from limestone reefs to soil, rocks and living things. For example, limestone is a very common rock and contains 44% carbon dioxide. Dissolving carbon dioxide in ocean water has not created ocean acidity. The constant chemical reactions between ocean water and sediments and rocks on the sea floor have kept the oceans alkaline. When we run out of rocks on the sea floor, then the oceans might become acid. Don’t wait up! We are still in an ice age that started 34 million years ago, with the climate driven, among other things, by the Earth’s orbit, the Sun, oceans and volcanoes. It is vital to remember that time, in a geological sense, is a far broader canvas than any of the detailed vignettes upon which the prophets of doom would have us focus. There have been long periods of warm times during this current ice age, yet the ice sheets did not melt. They waxed and they waned, as ice sheets still do today. Ancient climates can be revealed by drilling deep into the Antarctic ice for samples of what was snow thousands of years ago. These show climate cycles have a temperature peak at least 800 years before the peak in carbon dioxide. Climate change evangelists who insist that carbon dioxide drives climate change have turned the truth on its head – the rise in atmospheric carbon-dioxide content followed rather than heralded temperature increases. Climate is cyclical. The current cycles follow a pattern of about 90,000 years of highly variable glacial conditions followed by around 10,000 years of benign interglacial conditions. The current interglacial period started more than 12,000 years ago. We are due another glaciation. At the end of the last glaciation, temperature fluctuated wildly. At one time there was a 15°C natural temperature rise in 20 years. Now THAT is global warming. Yet still, humans thrived. The peak of the current interglacial was 6,000 years ago when the sea level was almost an inch higher than now and temperatures were 5°C higher than at present. The rate and amount of temperature change at present is no different to past times. Sea levels rose by 2cm per year between 12,000 and 6,000 years ago – still part of the present interglacial – a degree of change far greater than anything observed today. During the last glaciation, land loaded with ice sank. That land is now rising. For example, Scotland and Wales are rising and eastern England is sinking. During the last glaciation, people walked from Europe to England, from Russia to Alaska and from Papua New Guinea to Tasmania. The English Channel was a river. During previous interglacials, coral reefs and other life thrived. Each time sea level rose, coral atolls expanded. This may be startling to those fed a diet of climate change by scaremongers, but it is not new: Charles Darwin was writing about it in 1842. There have been smaller-scale climate changes in the present interglacial. Some are cyclical and driven by solar, ocean, tidal and orbital cycles. Others, such as volcanically driven changes, are random. Life thrived during warm times and life suffered in cool times. Great civilisations collapsed when it was cool. It was so hot during the 600-year-long ‘Roman warming’ that grapes were grown as far north as Hadrian’s Wall. Sea levels did not rise and polar ice did not vanish. Some Alpine glaciers disappeared, only to appear later. The cold Dark Ages followed: starvation, rampant disease and massive depopulation occurred. A 400-year warm period followed. The Vikings grew barley and wheat, and raised cattle and sheep in parts of Greenland that are now uninhabitable. During this ‘medieval warming’, there was so much excess wealth generated from generations of reliable harvests that the great monasteries, cathedrals and universities were built. Yet sea levels did not rise and the ice sheets were not lost. And, significantly, humans could not have driven the Roman and medieval warmings by carbon-dioxide emissions, as there was no industry. The Little Ice Age followed. There was famine, disease and depopulation. Ice fairs were held on the Thames up until the 1820s. The Little Ice Age ended in 1850. It is no wonder that temperature has increased in the past 150 years – this is what happens after a cold period. The temperature increase was not even. There was warming from 1860 to 1880, cooling from 1880 to 1910, warming from 1910 to 1940, cooling from 1940 to 1976, warming from 1976 to 1998 and now cooling from 1998. Each warming period was at the same rate. It was only during the warming from 1976 to 1998 that carbon dioxide increased in parallel with temperature – all other modern warmings and coolings show no relationship to carbon dioxide. This is the reality, these are the vacillations of the evocative story of our ever-changing planet derived from observation, measurement and experiment. Why is this story contrary to what we hear? Because sensationalism is so much more lucrative. A climate catastrophe was provided for an anxious public by scientists who had everything to gain by frightening us. They put forward an ideology that is blind fundamentalism, unrelated to scientific facts. Politicians build new bureaucracies and pose as environmental saviours without ever having to face the consequences of their actions. Heads must roll. Meanwhile, the planet will do what it has always done: change. Excellent history of climate. And consistant with my readings on the subject. Ah, the Gish Gallop (eerily reminding me of Ian Plimer). Aggregating so much disinformation in one post, you spend hours and hours dissembling each point, which is then ignored and another point is added. But I’ll take one anyway: Mt Pinatubo’s eruption in 1991, one of those volcano eruptions which supposedly can emit as much CO2 in one day as humans in a whole year, had NO effect on any of the atmospheric CO2 emissions performed in several places in the world. Wait, let me correct that: it had the *opposite* effect: CO2 was slighly lower than would be expected from the trend. Now, surely, if such an eruption can emit so much CO2 on a daily basis, we’d be able to see it in our measurements. But no such luck. Estimates of total emissions for Mt Pinatubo were about 0.05 Gt CO2. That’s what humans emit in half a day. That’s right, one HUGE volcano eruption, over several days, and half a day of human emissions already emit more CO2. Your misinformation has been corrected so many times already, the fact that you still throw it around shows you a prime example of “teh stupid”. Although one also should seriously consider whether it is not “teh malicious”. Deliberately repeating memes you KNOW are wrong, but which can easily fool those who have not had the pleasure of being exposed to the devastating rebuttal. This is when I wish we had the “marquee” tag still available in the formatting function, because this comment deserves to be surrounded in marquee lights, blinking with arrows pointing and and maybe even horns and bells and whistles announcing its existence. Wow, Sasha you did good. Brill. A remarkably complete refutation in a few words of the world’s latest and possibly unbelievably, silliest religion ever invented, and that’s saying something. Unfortunately as we know, once true believers have been struck by a heavenly vision, reason, rationality, perception and common sense fly out the window and blind faith takes over … augmented by substantial research grants on occasion. I am one of those stupid people who is a skeptic. In my case I have looked for actual evidence and have been unable to find “solid evidence” that CO2 is causing dangerous climate change. Can you show us some solid evidence that CO2 is causing dangerous climate change. (We both know that correlation is not evidence of causation and we both know that weather is highly variable as evidenced by extremes like the mediaeval warm period and little ice age, and we both know that the weather must have been warmer when the Vikings farmed Greenland than it is now, and we both know that, contrary to what he said, Al Gore’s ice cores show temperature rise occurring BEFORE CO2 rise.) So what is the evidence that convinced you that man’s CO2 is causing dangerous warming? Jim Karlock, correlation with a causative explanation (as in: we know the radiative properties of CO2, we can even measure it from space) is what we have. You may also want to read up on Milankovitch cycles and how those can explain the initial warming (for a few decades/centuries, depending on the cycle), but not the continuing warming for the remaining millenia. There, CO2 and the various feedbacks provide the explanation. Mr. Karlock appears in the comment thread on the Bellingham Herald site I referenced above. He has not changed. But wait! But waIt! Anyone who offers a contrary point of view , especially one supported by data, is “stupid”!!! Don’t you see? Such an easy, lazy shortcut to avoid having to argue on the merits! Computer models, OTOH, are Gospel — even though their controlled parameters are not “experiments”, and their results are not “data”. Ignoring the exclamation marks: show us your data. You are both pompous and arrogant. On the positive side you are also young and immature so there is a chance that you will stumble upon wisdom later in life. You are so stupid you don’t even know who you are arguing with. Good arguments but don’t hold your breath while awaiting a reasoned response. I contend that the greenhouse gas theory is an unproven worthless hypothesis. Peer reviewed evidence to back my assertion. Falsification Of the atmospheric CO2 greenhouse effects within the frame Of Physics” by Gerhard Gerlich and Ralf D. Tscheuschner; International Journal of Modern Physics B, Vol. 23, No. 3 (2009) pages 275-364. From the “alarmist” called Fred Singer. Well done, Bryan, you put yourself in a place which even Fred Singer shuns like the plague. I gave two links to peer reviewed articles which indeed say that greenhouse effect does not exist at all because it violates the Second Law of Thermodynamics — i.e., one cannot spontaneously transfer HEAT from a colder object to a warmer object. Both articles reminded us of the second law of thermodynamics formulated by Clausius. Marco on the other hand is one of the stupid ignorant people who does not know the difference between heat and energy. Although the article would imply that it is pointless communicating with Marco, I am ever hopeful that rational debate is worthwhile. So for Marco and others who are a bit weak in their knowledge of thermodynamics. 1. Radiation is transferred in both directions. 2. Energy is transferred in both directions. 3. Heat can only be transferred spontaneously from a higher to a lower temperature object. That is only in one direction. I agree with you – radiation is not heat, so the Second Law cannot apply. Marco and others like the “Sky Dragons” twist and distort science to fit their “head in the sand” take on the subject. They are an extremist minority, and are largely ignored. They are like the “emperor with no clothes”, but continue to argue how the cloth was woven and how it can possibly keep him warm. I’ve annoyed many by debunking some of their pseudo-science, but truth is more important than keeping such people as “friends”. The real argument is on the scale of the hypothesised changes and their effects, and on that subject, the science is not “settled” at all. Mostlyharmless, it appears you lack reading comprehension. The people who claim the Greenhouse effect violates the Second Law of thermodynamics are those cited by Bryan. If you yourself claim the Second Law does not even apply, you might just want to educate Gerlich, Tscheuschner, Kramm and Dlugi on that point, because they wrote papers claiming not only that the Second Law applies, but also that it is violated. I have provided him with links to both their peer reviewed papers. Perhaps he will point out where in the papers this preposterous claim is made? Or will he like an ignorant person simply buzz off. I’ll ignore your insult about my reading comprehension, and don’t label my views or my reading matter without knowing what they are – who’s “lacking reading comprehension” now? First, the Earth/atmosphere system is not an isolated system. Even if it was, or could be considered to be closed (if input & output are equal), any component of heat or energy flow in the system needn’t obey the Second Law. The “Slayers” now admit the effect of the cooler atmosphere is to slow the rate of cooling of the surface, and even that the amount of slowing is calculated by Stefan-Boltzmann, but argue that the mechanism of the slowing is not what it’s claimed to be. If that’s not arguing about irrelevancies, I don’t know what is. I don’t “attack people” I criticise their arguments or their lack of evidence. If that point of view is reasoned, and based on good science, he’s entitled to it, and I’m entitled to disagree, also based on reason and logic and science. I’m certainly not a “Wattsian” as you put it (labelling without knowledge or facts again) – there’s an awful lot of rubbish and irrelevancies spouted in the comments on that blog. I used to be a regular reader, and less frequent commenter, but it’s lately become just a kind of “Twitter” blog where commenters “have their say” to get their name or handle on the most popular sceptical site on the ‘net. There’s little in the way of interactive dialogue or argument there now, yet this thread is steaming. I’d suggest we put our feelings on one side and continue the argument in a more civilised fashion. While I may disagree with you in particular, I’ll concede that you’ve at least given the subject some thought, unlike those on both sides who let others do their thinking for them. I agree with your civilised rational approach to the climate discussion. Marco does not realise that you ( I guess) are closer to the IPCC position than I am. Proceeding from a physics framework its clear that many commentators on both sides of the discussion find themselves outside well established principles and laws. I try to keep both sides back on track and I think you do the too. All my comments about ignorant and stupid people are’ tongue in cheek ‘ in response to the tread headline. I am exactly of the opposite persuasion. One truism I subscribe to is , the only stupid question is the one that is not asked! You are arguing a strawman (and so did Gerlich and Tscheuschner, and Kramm and Dlugi). The Greenhouse Effect does not talk about spontaneous transfer of HEAT from a colder body to a hotter body. But I noticed Steve Carson (Scienceofdoom) has tried to educate you on the topic, but found himself faced with someone who simply was incapable of learning. Further discussion is useless with someone who argues a strawman. But read your own comment above!!! You said ENERGY rather than HEAT! Is this the kind of confusion that Policy Lass identified with a stupid person? It’s not my own comment, it is a quote from Fred Singer. And if you do not disagree with that statement, which you appear not to do, what’s the problem? Well, the problem is that Gerlich and Tscheuschner *directly* claim that radiation cannot affect the temperature of the ground. As Steve Carson also pointed out, Kramm and Dlugi, despite claiming to be in agreement with Gerlich and Tscheuschner, contradict that fundamental claim of G&T. Not that I think any of this makes any dent in your beliefs. Steve Carson tried to explain the basics to you many, many times, but you just kept on repeating the same talking points. Since I expect the same to happen here, it’s better to just leave you alone. You said above that problem is that Gerlich, Tscheuschner, Kramm and Dlugi said that energy cannot be transferred from a colder to a warmer surface spontaneously. Any intelligent person can read your post. I have provided links to the papers and asked you to substantiate your statement. Any intelligent and polite person would expect you to withdraw this groundless allegation if you cannot substantiate it. Any intelligent person will note that you are squirming, changing the subject frequently. Only an ignorant stupid person thinks that this will convince a neutral reader. Bryan, I know you got a bit upset at SoD, because you could not prove any of your claims, and had your dear friends G&T and K&D shown for what they are: cranks. Since your behavior there amounted to “lalalalalala, I don’t want to hear it, you are wrong”, there’s really no use to discuss any of this with you. Fact remains that G&T and K&D contradict each other, that G&T claim that radiation from a cold surface cannot warm a warm surface, and that the latter in essence comes down to claiming that energy cannot be transferred from a colder to a warmer surface. The neutral reader who knows thermodynamics will read scienceofdoom and wonder how G&T ever got that crap published (being a publishing scientists, I can tell you how, but you will not like it). Similarly, they’d wonder how K&D’s complaint about one figure in one textbook somehow invalidates a whole field. In fact, the neutral reader would think that K&D apparently lack evidence if they need to resort to such complaints, and that they are attempting to fool naive people. Several times you have been asked where in the papers this absurd claim is made. Instead of substantiating your claim you seek to distract readers by switching to threads on other sites and further groundless accusations. You fool no-one by yourself. This butterfly tendency you display, with an inability to concentrate, is not a hallmark of an intelligent person. It’s implicit in the claim that the greenhouse effect violates the second law of thermodynamics, and in their insistance in only looking at unidirectional heat flows. In reality, we all know (yes, probably you too), that the greenhouse effect does not claim there is a *net* heat flow from atmosphere to surface, and that it is the latter that Gerlich & Tscheuschner attack (and Kramm & Dlugi by proxy in attempting to support G&T). It’s the same behavior as creationists attacking evolution, claiming it violates the second law. In doing so, they *directly* claim the sun does not exist. Marco implies that there are two heat flows in a radiative interaction between two objects at different temperatures. Marco it appears has no idea of the difference between the terms ‘heat’ and ‘radiation’ is the kindest interpretation I can make of his comment. A clear understanding of the terms ‘energy’,’work’,’heat’ and ‘radiation’ is required before you can begin to understand the second law. Because of this confusion of terms Marco (inadvertently perhaps) is giving the impression of ignoring the second law of thermodynamics. Some continue to use the term NET HEAT for a two way radiative exchange. This is wrong but understandable as some commenting on climate science are in a muddle about what exactly the difference is between heat, energy, work and radiation. There is no heat flow from colder to hotter object! Use this as the test to see if an energy transfer qualifies as being HEAT. 1. For a complete cycle extract energy at a higher temperature source do work then dump unused energy to lower temperature sink. 2. From colder to hotter object, spontaneously extract energy do work and dump unused energy to higher temperature sink NEVER HAPPENS. Gerhard Kramm has recommended some thermodynamics textbooks. I would add ‘Heat and Thermodynamics’ by Zemansky; this book has the distinction of being the only textbook recommended by Feynman in his three volume lecture notes. There we go, Bryan arguing semantics. If you agree that radiation goes both ways, you are starting to grasp the basic concept of the greenhouse effect. Now you only have to accept that this radiation does not care whether it falls on a surface that is warmer or colder than the place it originates from: it can be absorbed and thereby heat the surface. Something that apparently, according to Gerlich & Tscheuschner, contradicts physics. There is no other interpretation of their claim that the greenhouse effect violates the second law of thermodynamics. The difference between radiation, heat, energy and work is not semantics. Its what the second law is all about. If your too lazy to read a thermodynamics book then all my patient explanations are wasted. Certantly not Gerlich & Tscheuschner Kramm and Dlugi ! There is no shortcuts to actually reading their papers for yourself. I have asked you repeatedly to point out in the papers where your odd claims come from. I can link the papers again if you have any problems accessing them. I just thought I drop by (From WUWT) and just to show there are no hard feelings I brought you some fudge. In the TAR, the latter never comes into it in their analysis (i.e., the ‘derivation’ of the GSIC formula) — but my point is that it *does* come in by accident due to the quadratic FUDGE factor. The total volume range is 5-32cm, which is, at the very least, inconsistent with other material in the chapter (see below). 5cm is clearly utterly ridiculous. you enjoy teh fudge now! 4. It is practically and politically possible to stop or mitigate the changes. 5. The cost of mitigating or stopping the changes will be less than the cost of adapting to them. The probability of a conjunction of statements is the product of their individual probabilities. When we multiply these probabilities out we get about 43% — in other words less than a 50% chance that spending all that money will be justified. If that’s what we get from an incredibly generous estimate of the probability of these claims being true, what do you think we would get from a realistic one? As you can see, the big problem is number 3. We don’t know what number 3, and while there are a wide variety of estimates there is a large amount of deviation amoung them. We could do the average, but it is very vulnerable to outliers and using the median ignores the possibility of major changes. The best solution is to wait until resolution amoung the estimates becomes more accurate, but that makes the effects worse if the high estimates are correct. I’m not sure if the waiting period expired a decade ago or if it is still ongoing, so I’ll let someone else state the current spread of science estimates on global warming impacts. I personally think the William Nordhaus or the IPCC has a good current estimate, although I think aside from taxes, you need to change current blockages- if you think food will be a problem, make it easier for GM crops to be developed and sold and if energy is a bottleneck, reduce restrictions on nuclear. Yes, people will die if you remove safety restrictions, but they’ll also die if they get hit by storms. This is logically inconsistent with your statement in your comment Policy Lass Reply April 20, 2012 at 11:14 pm. Surely if I was stupid I would follow point 2. and would think that Lindzen, Spencer, Dyson, etc know less than they do. I don’t think that is a very logical or consistent position that you have taken. Fascinating, and I learned something here… Learned about the DK efffect. I believe this blog and its owner(author?) is probably a case study for it…. Ah, it must be good to get the old tar brush out every now and then! Policy Lass has bailed on her own website. All these stupid facts have gotten in the way. Discussion becomes quite proftable by turns. Loved ‘they’re intelligent but talk bilge’, about Lindzen et al. How do these people ever get their stuff past peer review, eh? But, um, mightn’t this admission of intelligence lead to unaccceptable consequences? Because they’re smart, don’t we have to debate these deniers precisely because we exclude the halfwits? It follows from ‘ignore the stupid’, no? Pitifully ironic, classic case of projection. No reason, no logic, only a pretentious rant unsubstantiated by fact. Humorous. Wherever possible, there must be independent confirmation of the facts. Arguments from authority carry little weight — “authorities” have made mistakes in the past. They will do so again in the future. Spin more than one hypothesis. If there’s something to be explained, think of all the ways it could be explained. Quantify. What is vague and qualitative is open to many explanations. Ask whether the hypothesis can be, at least in principle, falsified. Propositions that are untestable, unfalsifiable are not worth much. Most readers will agree that this approach is very Popperian, and strictly in opposition to the post-normal science preferred by those who believe that the threat of climate change outweighs the normal give-and-take of the scientific method. It required decades for plate tectonics and the glacial lake origin of the channeled scablands of Washington state to become accepted theories. However, many believe that the risks of waiting are far too high to allow that long a debate to go on regarding anthropological climate change. “Substantive debate”? When did that happen? “The science is settled!,” we’re told. More than one hypothesis? Except for the “deniers,” has any climate scientist proposed any other hypothesis for the observed warming since the 1850s other than CO2 increase? Overly attached to a hypothesis? I think so. Quantify? Maybe. The original data in many cases is lost, however, and much of what we have to look at has been statistically altered in unknown, and therefore possibly incorrect, ways. Does every chain in the argument work? Really? Occam’s Razor. We observe changes in the earths’ climate. We know these changes have occurred previously throughout geological history. Do we really know enough regarding their causes then to be able to say unequivocally that human activity is causing them now? I came into the ‘”climate war” fully prepared to be convinced of the validity of the AGW argument. It certainly seemed to possible that the vast activities of humanity might affect the chemical behavior of the atmosphere. However, watching the behavior of the two sides regarding evidence, debate, and transparency has convinced me that this is more a political argument than a scientific one, due to the influence of post-normal scientific precepts. The problem with post-normal science is that the threat must be clearly defined in order that the “normal science” be disposed with: in the case of AGW, that threat is what we’re trying to quantify, and therefore not allowed to be the driver as well. More seriously, scientists have to include all the relevant inputs in their models if they are trying to explain what is happening. I know that El Nino and La Nina are currently included, as well as areosols to explain the historic record. I think James may want to check what Carl Sagan had to say about climate change. I recommend the fourth part of the Cosmos series. Sagan also may well have been the very first scientist who was so vocal about global warming. Except for “deniers”, does anyone here believe the world existed before 1850? As all real climate scientists know, it is reasonable to assume the earth was created in 1850 since this makes the hockey stick easier to validate. No more irritating problems such as ice ages while CO2 was at many thousands ppm, etc. Policy lass, the advert about signs of Alzheimer’s disease just below your article could not be more appropriate. I think all the beefburgers you ever ate are coming back to haunt you. > informed people know less than they do. It is very convenient to dismiss opponents as stupid and/or ignorant. It save one the time of digesting and refuting their arguments. (By the way, stupid and ignorant are not synonyms, as your quote appears to suggest). There *is* a great deal of ignorant barracking in the so-called “global warming debate”, but the sceptical side has no monopoly on it. While some of the articles at WUWT and CA do amount to barracking, many of them contain considerable scientific content. You are welcome to refute the science, but to brush it off without consideration suggests that you are not immune to the problem of ignorance. The articles at Climate Etc. appear to always be scientifically based and Dr Curry bends over backwards to be inclusive of all points of view, including the “consensus” view. The comments on those sites, like all sites, vary greatly in content and are often ignorant. That is, however, no reason to judge the articles. Well said, sir. The best post on this thread by far. It is all too easy and self-satisfying to mock and to hurl insults, far harder to understand arguments and reason about them. The problem is that the sceptical arguments are so self-conflicting and contradictory it’s amazing that you can agree on simple spelling, let alone the science. It’s pretty certain that, collectively, ye sceptics by and large don’t even understand each others’ arguments, and would never be able to find the time to do what you expect of others. Well, one might say Q.E.D. A perfect example of my point. > can agree on simple spelling, let alone the science. Sceptics are not some uniform block. There are a multitude of people who are unconvinced by the CAGW arguments. Some are ignorant, some are probably a little crazy. Many others are competent scientists who have raised legitimate problems with the science. e.g. Roy Spencer, Steve McIntyre, Judy Curry, etc. Is it? Certainly some amongst the wide variety of sceptics lack understanding, but to tar everybody with the same brush seems a rather ignorant act. Is there any evidence behind your claim, or is it the usual ad hominem garbage? > you expect of others. What we expect? Such as to provide supporting evidence for their alarming claims? Yes, let’s take society back to the stone age because otherwise the world will end. Oh don’t worry about evidence. You can trust the scientists. (For the comprehension-impaired, that was facetiousness). To be clear, I am a sceptic. Not just a CAGW sceptic, but I am sceptical of everything. You want me to believe your theory, I want to see the evidence. “Trust me” is just not good enough. I’ve been looking hard, but the evidence for CAGW that I’ve seen so far is simply not convincing. I’m still looking and one day I might be convinced, but so far it is simply not good enough. Some things are well established. — CO₂ is a greenhouse gas. — Atmospheric levels of CO₂ have increased and are increasing. — Humans probably play some role in that, but it is unclear how much. — Increasing CO₂ applies an upward forcing on the temperature, but it is not clear how much. — Multiple feedbacks occur when forcing is applied to the temperature, their magnitude and signs are not well understood. — The concept of a global temperature is without any practical scientific meaning. There is no agreed formula to compute such a value and available data is too sparse to produce any meaningful number. — Many regional temperatures have risen in the last 100 years. — The published temperature records have been modified and “corrected” a number of times in the last 30 years. These modifications may be justified, or may be gratuitous fudging. There is not sufficient evidence to be sure. — Regional temperature rises may be influenced by rising CO₂ levels. It is not clear how much influence there is. — There has been little or no net rise in regional temperatures since the late 1990s. — The likelihood of future, runaway temperature rise is fairly low. — The sea level has risen slowly for several hundred years. — The likelihood of future, runaway sea level rise is fairly low. — No convincing evidence has been demonstrated of a link between atmospheric CO₂ levels and natural disasters such as storms, tornadoes and earthquakes. Which of the above points is hard to understand? I am sure you do not agree, but surely even such a narrow mind can understand it. You have to have a good chuckle when one of the ‘skeptics’ whines about ‘alarmists’ and then says reducing carbon emissions will “take society back to the stone age”. Then, says there is no such thing practically as a gobal temp (oh dear, where’s the scepticism on that old claim!) and then talks about “regional temperatures”. Temp record corrections may be “gratuitious frudging” – where’s the evidence for that claim? What, there is none? – so where’s the scepticism? And he thinks the rise in CO2 might have nothing to do with the massive amounts of stored carbon we’ve been burning off. We have evidence, besdies the obvious correlation, via radio-isotpes, and ZERO evidence that it’s some natural phenomena. Oh dear, somebody has a bit of a problem with reading comprehension. I’ll take it a bit slower. > emissions will “take society back to the stone age”. The term “the stone age” was hyperbole. (Look it up at http://en.wikipedia.org/wiki/Hyperbole). However the desired 80% reduction in energy use will leave us with a society that is not entirely dissimilar to the stone age. We can use solar power, unless we need it at night, or on cloudy days. We can use wind energy, unless we want birds, or power on non-windy days. However both of those options will cost two to five times as much, so in the rare times when power is available we won’t be able to afford it. No, I said that it is scientifically meaningless. Also I said “global”, not “gobal”, but I won’t split hairs. Please *try* to read what I said, not what you *think* I said. If you believe that there is an accurate, reliable formula to compute global temperature then please share it with us. Unless there is, then it doesn’t mean much. > and then talks about “regional temperatures”. Seriously? You don’t know what a “regional temperature” is? It is the temperature for a specific region. This is something that we *can* compute, where we have a sufficient density of thermometer readings. Google is your friend if you don’t understand basic terms. > where’s the evidence for that claim? What, there is none? > – so where’s the scepticism? Next to the amount of CO₂ stored in the oceans, human emissions are relatively small. Not to mention the CO₂ from other sources such as decomposition of vegetation. I don’t know how much of the increased CO₂ in the atmosphere is from burning hydrocarbons. Maybe most of it, maybe less than that. I have not seen convincing proof, yet. Because we haven’t proven that it is a natural phenomenon does not prove it is from humans. It may be from humans, or we may just have not yet found the proof. As I said, I don’t know. (and neither do you). The isotope correlation is broadly consistent with human-caused CO₂. But correlation is not proof. The jury is still out. Well, that must be embarrassing. I guess it is an indictment on modern education. They no longer teach logic or scientific principles. They don’t even teach reading comprehension. Maybe you can sue your teachers. The amount of CO2 contributed by humans isn’t of a high magnitude- the problem is that natural CO2 emission and absorbtion are roughly the same so human additions increase the stock of CO2 in the atmosphere. And no, I wouldn’t recommend trying to destroy natural sources of CO2 emissions. Although stopping global warming by sealing off volcanos and carbonate rocks and killing fluffy bunnies has a certain demented mad scientist charm. The alleged ‘critique’ of the concept of global temperatures stands for regional temperatures; how do you define a region,is it just one data point for a much larger area, or mutliple across a defined area, then averaged? Define ‘region’ – are they always the same size, blah blah, blah, blah. Pure nonsense. ACO2 – As I said (which you apparenly couldn’t understand, even though i used the word correlation – should I have explained ‘correlation’ for you so you weren’t confused? )), strong correlation, plus the evidence thru radio-isotpes = very strong case. That it might be something else – no evidence. When we have good evidence that it’s X, saying that it might be not-X, with no evidence of any not-X – wishful thinking, not science. “fudging” temp records. Watts! OMG!! This is the guy who was crying “fraud” on the temp records years ago, without any evidence, just his belief. Finally, his wild claims had the blow-torch of scientiffic inquiry turned on them and…..nothing. Watts primary claim was absolutely wrong. But fanbois will be fanbois, and damn the science (scepticism? – Ha!!!!!). But yeah, you got me on those typos……. Er, when people talk about “stone age” they mean massive reduction in living standards. It has been used that way since at least the 1965, when Curtis LeMay used the term “bomb back to the stone age”. Err.. the point was the irony of MichaelJ bewailing “alarmism” and then in the very next breath proclaiming the end of civilisation. Apparently, this is too hard to grasp. He didn’t say civilization would end. He said alarmists wanted to take the world back to the stone age. I’m not certain how this is hypocritical as it depends entirely on if alarmists are nuts. So yes, there are people who are climate alarmists who are entirely nuts and who advocate extreme policies that will revert humanity to the stone age. If you think ‘the stone age’ overlaps with any part of civilisation, I’d like to know which bit……. And equating altenative energy sources to hydrocarbons ot the return to “the stone age” is nuts on steriods. It’s a high tech future, not a friggin’ stone age one, you numbskulls. ‘Skeptics’? Nah, just the new luddites. That is sort of what powered descent from civilization is implying. “And equating altenative energy sources to hydrocarbons ot the return to “the stone age” is nuts on steriods. Since you don’t seem to get it, I’ll explain. Solar panels only work when the sun is out and wind only works with wind. Skeptics think that environmentalists are out to reduce the energy supply and given environmentalists attacks on hydro and nuclear power (which provide constant energy) I can’t call them paranoid. The exact situation skeptics fear is rolling blackouts, the loss of appliences that require constant power (like refridgerators) and the switch from electricity to muscle power to insure constant output, all of which would result in a massive drop of the standard of living…. …and your rebuttal is that the future will be “high tech. High tech means complicated, it has no relevance to wheter or not something is actually any good. Case in point. That isn’t what I said. I explained that I was using hyperbole. I even gave a link to a definition of hyperbole. A person with adult-level reading would not need to be told that, but you haven’t yet got it even after additional explanation. If I say “the red team killed the blue team”, nobody really thinks there was any death involved. It is hyperbole. Now re-read what I wrote and you might understand that paragraph. Sigh. A region is whatever you define it to be. Let’s say we choose the city of Las Vegas. Look at a map and define some physical coordinates to describe the city. You can now find all temperature measurements within that region and compute a mean temperature and say that the temperature in your region is say 25°C +/- 2°C (for example). You can look at the way this changes over time and determine whether your region is getting hotter. To contrast that, on a given day it might be -80°C in the Arctic circle and +50°C in Death Valley. How do you compute a mean temperature? Some areas have many thermometers, some have none. Even if you compute a mean, it does not really tell you much. If the mean rises by 1°C, what has that told you? Maybe some regions went up and others went down. A regional temperature can at least tell you what changed in that region. If many regions are rising in temperature, then we may have some climate change. I understood what you meant. You were just wrong. I said “the jury is still out”. Correlation cannot prove anything, but lack of correlation can disprove something. I saw an article once that showed that the CO₂ correlates with the number of Starbucks stores. So do we conclude that CO₂ causes Starbucks stores? Of course not, that would be silly. The fact that “Carbon isotopes measured” correlates with the hypothesis that humans caused most of the CO₂ increase, means that the hypothesis is reasonable. We don’t yet know if it is true. There are some other hypotheses. Your hypothesis may be correct, one of the others may be correct or it may be something that nobody has thought of yet. We just don’t know. > “fudging” temp records. Watts! OMG!! Yes, it was a mistake to mention Anthony Watts as you obviously would not read things on his site. There are hundreds of articles on the subject, all over the web, but I won’t waste my time digging up others as you won’t read them. If you really are interested, go to the Uni of East Anglia site and download a copy of their HADCRUT data. Then go to Archive.org’s “Wayback Machine” and download a version that is two or three years old, and see the difference. Try to find detailed information on what was changed and why. Good luck with that. I stand by my position that we don’t know whether the temperature records have been fudged. MichaelJ digs his hole deeper and deeper. I just explained it to Sam, so I’ll re-do it for you. You complained about “alarmism” and then immediately started on about “the stone age” which you now defend as just “hyperbole”. Well, that’s the critique implicit in the term “alarmism” – it’s exaggeration or using another synonym…..hyperbole!! You clearly don’t know the etymology of your own talking points. Global temp had an attempted de-bunk by McKitrick etal – one of the pillars of their argument was how you couldn’t average temp, it was physicaly meaningless. Yet, here you are, pushing their failed critique of global temps, but arguing for ‘regional temps’ based on the idea of averages that they reject. As i was at pains to point, out, I didn’t say the correlation was proof – it is a good indicator,and is backed up by good physical evidence. Proposition B: no known correlation, no evidence. — notice the log that is in your own eye? A tu quoque enshrined in an appeal to authority. I do haunt those sites, and in respect for your idea that stupid people who think they know more than they do are not worth arguing with, I will say no more. O, Matt. 7.3-5 is pretty good tho’. @Michael — I’ll stop here. You don’t understand what I wrote so I won’t keep on arguing. Have a nice life. > You don’t understand what I wrote so I won’t keep on arguing. There is no agreement on whether climate change will be “deleterious or advantageous”. Until that question has been settled it is lunancy to commit huge sums of money on the assumption that the answer is “deleterious”. It is impossible to settle. Even if past increases in temperature causes beneficial, negative or null effects, future temperature increases will have different effects. Let me a simple example. Increasing temperature makes it say harder for plants to grow. However, this interacts with changes in rainfall which changes the magnitude or future advances (like GM plants that thrive with high temperatures). Hell, if we start growing food in greenhouse skyscrappers because hydroponics becomes more efficient, changes in crop growth stop being an issue. This may sound silly, but the timescale people are talking about is centuries. It bears repeating that, even though we can’t create a settled answer we can create a reasonable answer with the best available evidence- I hear a 7 cent tax on gas is the way to go. Wrong question. You should be asking how the Hockey Team (Hughes, Briffa, Mann, Ammann et al.) ever got any of their junk science through peer review. You should also be asking why the Hockey Team has almost 200 citations in the AR5 WG1 chapter 5 (Paleo Climate) due for publication in September 2013, while Lindzen has zero and Craig Loehle has only one. It could be because Lindzen has never published a paper on paleoclimate and Loehle only has the one reconstruction — the update to his error filled first attempt — which has any credibility. Nah, it’s really a conspiracy, a conspiracy I tells ya! You gotta love simple rebuttals presented very simply. There seem to be a lot of Wattsians who have descended here. Some may legitimately be described as sceptics rather than denialists. May I ask you all a simple question? You usually, with great confidence, pour scorn on any evidence suggesting that fossil fuel derived global warming could be dangerous. In the comments on Wattsupwiththat ideas and assertions are frequently expressed that are demonstrably wrong, irrelevant or silly. Many of these ideas can be definitively shown to be wrong yet they continue to be regurgitated in the blogosphere as if they were like the unkillable Freddy Kruger in the umpteenth Nightmare on Elm Street sequel. Why do the small percentage of genuine sceptics only pour scorn on the mainstream science position yet seem not to pour scorn, or even mild disapproval, on the posts of the incorrigible conspiracy types who regularly post junk views? Blatant crap which could be simply debunked by anyone who read any of the IPCC reports and yet “Sasha” asserts his “belief” with certainty. Why did none of you sceptical Wattsians jump on this post or any similar to it? Surely you must see that the presence of so many like Sasha spouting so much colossal nonsense in the media, that you never clamp down on, is the reason why the warmist side considers you a bunch of idiots at best, politically driven liars and deceivers at worst? Probably the same reason people who considered themselves rational tripped over themselves to provide apologetics for Gleicks actions. Or how the big push is against deniers instead of people who block nuclear power and GM crops. Namely once you pick a side you avoid attacking people who are also on your side because it weakens your side. Arguments become less about truth than about strategy- sure your allies are nuts, but they support you and that is the important part. MSNBC reports that the lack of temperature rise in the last 12 years has convinced environmentalist James Lovelock (The Gaia Hypothesis) that the climate alarmism wasn’t warranted. From his Wikipedia entry: Writing in the British newspaper The Independent in January 2006, Lovelock argues that, as a result of global warming, “billions of us will die and the few breeding pairs of people that survive will be in the Arctic where the climate remains tolerable” by the end of the 21st century. He has been quoted in The Guardian that 80% of humans will perish by 2100 AD, and this climate change will last 100,000 years. According to James Lovelock, by 2040, the world population of more than six billion will have been culled by floods, drought and famine. Indeed “the people of Southern Europe, as well as South-East Asia, will be fighting their way into countries such as Canada, Australia and Britain”. Sasha. You prove your incorrigibility and your willingness to accept any old crap (Watt’s cherry picked phrases etc) by clearly being sucked in by Watt’s and Milloy’s misrepresentation of Lovelock’s position. James Lovelock has backed off from his former position, which he formulated 20 years ago, which was probably more extreme than Hansen’s and definitely a lot more alarming than the mainstream science view. So what? That is a scientist modifying his views as information comes in. He still accepts the mainstream science, he still expects the averaged temperature to go up and keep going up, just not as break neck fast as in his previous maverick published ideas. That Watts and Milloy are touting this as some sort of major climb down and implying, as they always do, that there will be no problem from global warming, is just more of their incorrigible and dangerous BS. Yet more insults, thank you so much. As for “being sucked in by Watt’s and Milloy’s misrepresentation of Lovelock’s position” did you actually bother reading what was written? The implications of Lovelock’s new position are startling. Anyway, I can see that this is not a scientific site but is a religious one. You don’t require facts, only belief. And of course, a whole bunch of this nonsesne is not peer-reviewed at all, it’s just opinion appearing in some low-grade journal. If the ‘skeptics’ really had an argument, they wouldn’t keep trying this kind of crap. Yes Michael, I get a laugh every time that list is brought up by the deniers. Maybe we should invoke a new law to replace Godwin’s Law and call it “Poptart’s Law” which would say that a discussion is over whenever a participant introduces Poptart’s list of “peer reviewed” papers. Needless to say they would lose the argument. Isn’t it hilarious how someone makes several ludicrous statements and, just when you think it can’t get any worse, we get Poptart’s List. There can be no more obvious evidence of the complete gullibility and absence of genuine scepticism of the pseudosceptic. Of course that would be Forrester’s Corollary to Godwin’s Law! *Forrester’s”, of course. Sorry about the misspelling. The scientists featured in the report express their views in their own words, complete with their intended subtleties and caveats. This report features the names, biographies, academic/institutional affiliation, and quotes of literally hundreds of additional international scientists who publicly dissented from man-made climate fears. This report lists the scientists by name, country of residence, and academic/institutional affiliation. It also features their own words, biographies, and web links to their peer reviewed studies, scientific analyses and original source materials as gathered from directly from the scientists or from public statements, news outlets, and websites in 2007 and 2008. Any explanation from you as to why you were so gullible as to believe that your previous link really did have 900 “peer reviewed” articles?? Not very sceptical of you. Is this latest just more denialist link spam?? Yes Michael, just more denier link spam from that stupid politician Inohofe and his dishonest side kick Morano. What next Sasha are you going to bring up that other discredited list of “scientists” who oppose the science behind AGW? Please don’t go three for three and give us a link to the Oregon Petition. That would just show you are even more stupid than your regular denier stupidity. Plus for a complete debunk of the “Greenhouse Effect” theory visit http://arxiv.org/abs/0707.1161 where you will find “Falsification of the Atmospheric CO2 Greenhouse Effects within the frame of Physics” by Prof Gerhard Gerlich. This is the most complete demolition of the hypothesis that I have read. [It offers a download of a PDF full of facts and figures] For an easier read try http://realplanet.eu/error.htm where Dipl-Ing Hienz Thiene does a similar job in “Greenhouse gas hypothesis Violates Fundamentals of Physics”. 750 reputable scientists signed the report to the US congress on man-made global warming that basically said it’s all a fraud. Russia: Russian scientist Dr. Oleg Sorochtin of the Institute of Oceanology at the Russian Academy of Sciences has authored more than 300 studies, nine books, and a 2006 paper titled “The Evolution and the Prediction of Global Climate Changes on Earth.” “Even if the concentration of ‘greenhouse gases’ double man would not perceive the temperature impact,” Sorochtin wrote. (Note: Name also sometimes translated to spell Sorokhtin). Czech Republic: Czech-born U.S. climatologist Dr. George Kukla, a research scientist with the Lamont-Doherty Earth Observatory at Columbia University, expressed climate skepticism in 2007. “The only thing to worry about is the damage that can be done by worrying. Why are some scientists worried? Perhaps because they feel that to stop worrying may mean to stop being paid,” Kukla told Gelf Magazine on April 24, 2007. Yet another list of tripe from the credulous Sasha, as if anyone here hasn’t seen it a 100 times before. Lovelock himself is unhappy about what he said being so misrepresented. As far as those 450 and 900 papers go – if you really believe they show what denialists portray them as showing then your comprehension of reality is poor. Watts and Milloy are massive spreaders of deceptive BS. If you can’t see that just from the way they write, there is no hope for you. You must learn that just because people say things you want to believe does not necessarily make them true. No doubt you will take that all as an insult but it is not – it is a simple description of your perceptual ability. In addition, the fact that your response to being shown up is empty rhetoric without the slightest trace of self doubt shows that you are Dunning- Kruger arrogant too. Do you know *anything* about the history of the science you call a “scam”? Do you know how Lovelock’s views have evolved over time? Do you know the reasons for those views? Do you realise that Watts and Milloy are not reliable sources for anything, especially Milloy: no one with any sense trusts a single word he writes. Isn’t hilarious how the Wattards who’ve come over here have demonstrated, over and over, the correctness of our host’s assertion? The IPCC reports are so out of date that they are now virtually useless. There has been papers published showing the energy imbalance is .5Wm2 rather than .9. This is just for starters. There’s another comment for the ‘Dopey Awards’. Mum, I’ve told you about your swearing on the internet. It’s soooo embarrassing. I am ticked off by the fact that Anthony Watts blocked William Connolley from commenting on WUWT. Connolley was unimpressive whenever he attempted to debate the issues over there. Typical rubbish from Galloping Camel. When shown to be stupid by making an elementary error i.e. not even knowing who started the original thread, he tries to divert his stupidity by going into “non sequitur” mode. WC has not commented on this thread so why address him? And honest people wonder why we refer to deniers as being stupid. When Anthony Watts (wrongly in my opinion) blocked William Connolley’s comments on WUWT he did it openly. This site has now deleted my comments twice but covertly. I guess I should feel honored to find that my humble comments are considered too dangerous to be displayed here. Let’s see whether this comment gets “Moderated”. Your comment went into the spam folder. Probably because of the link you included. I’ve unspammed it. Q. : As popular amusements ,what’s the difference between going to see the madmen of Bedlam in 1712, and reading climate blog comments three centuries later ? A. : Bedlam used to charge spectators sixpence for the privilege. Many thanks to The Policy Lass for providing so affordable a spectacle. This is a matter of the G&T-Paper. Later, Ralph Dlugi and I criticized the example of 2.1 of Halpern et al. (2010) because their formulation of the entropy flux notably disagrees with that of Planck (1913). We did not discuss the 2nd law of Thermodynamics when we scrutinized the so-called atmospheric greenhouse effect because it was not necessary. Gerlich & Tscheuschner (2009) presented the local balance equation for entropy (Eq. (143)). If you believe that this equation is wrong, then you have to show why. d(rho s)/dt + div (rho s v + J_s) = sigma_s . that is also larger than zero in case of irreversible processes. Note that the term div (rho s v + J_s) describes the exchange of energy and matter by the system under study with its surroundings. This means that this system is an open system in the sense of thermodynamics. I recommend to read the textbook of de Groot & Mazur (1969) on non-equilibrium thermodynamics. This classical textbook has been cited in the respective literature more than 5000 times. I also cited it several times. Gerhard Kramm, you were asked a few very simple questions on the Science of Doom website. In particular, your own article contradicting your conclusion, and most notably, contradicting Gerlich & Tscheuschner. Despite commenting there several times, you refused to answer those simple questions. This type of dishonest behavior makes me unwilling to engage in any discussion with you. Before you go read Groot & Mazur, could you bring me a cup of coffee? Thank you for unspamming that link describing my visit to NOAA at Asheville, North Carolina where I met several of your colleagues including Tom Peterson. Whether you trust the professionals or this clueless camel the answer is the same. The Greenland ice cores clearly show the Minoan Warm Period, two Roman Warm Periods, the Dark ages, the Medieval Warm Period and the Little Ice Age. Who are you going to believe? Stupid camels, learned scentists and historians or Michael Mann? I beg your pardon, but it seems to me that you are not able to understand scientific papers. Your arguments that my own article contradicting my conclusion, and most notably, contradicting Gerlich & Tscheuschner is sheer nonsense. By the way, I only participated on the discussion on the website Science of Doom for two short period because I am a scientist, but not an active blogger. When I realized that some participants like Joshua Halpern (alias Eli Rabett) started to torpedo any scientific discussion with stupid arguments, I stopped watching the website Science of Doom. Should I response to such a statement? “Congratulations Dr. Kramm, you have discovered the stratosphere. You WILL produce the mother of all inversions, it is the difference in temperature between the mid stratosphere and the tropopause, about 40 K and it is why the stratosphere is stratified. Of course, since the ozone cannot radiate in the IR anymore, the inversion will be even larger and the tropopause will be pushed down by whatever heat conduction mechanisms are still available. Again, should a response to such statements? Sorry, my time is too valuable to response to Halpern’s “bla bla blubber”. Some persons sent e-mails to me and ask for additional information. To answer these e-mails was more important to me because these persons are real, but not anonymous bloggers. > Sorry, my time is too valuable to response to Halpern’s “bla bla blubber”. I believe Michael J has an answer above to this kind of communication closure. What was it again? in response to the user Marco I only gave an explanation why I did not further watch the discussion on the website Science of Doom. One of my professors in the Physics of the Middle and Upper Atmosphere at the University of Cologne, Germany, was the late Hans-Karl Paetzold. He is well-known for his research results on stratospheric ozone. He, for instance, already detected a so-called ozone hole over the Alps in the fifties of the past century and related it to dynamic reasons. The results are published in the paper of Paetzold and Regener (1957) published in Fluegge’s Handbuch der Physik. In 2005, Pyle and Susan Solomon mentioned an unusual ozone hole in 2002 due to dynamical changes (see http://www.google.com/url?sa=t&rct=j&q=solomon%202005%20ozone%20ipcc&source=web&cd=3&ved=0CDEQFjAC&url=http%3A%2F%2Fwww.ipcc.ch%2Fpdf%2Fpresentations%2Fbriefing-bonn-2005-05%2Fozone-depletion.pdf&ei=fZCZT8fvF-mUiQKiu6XzDg&usg=AFQjCNED5bDukHW-uXZ4zonnqAwXEADBrQ&cad=rja ). They stated that dynamics is important, along with chemistry. It was already pointed out by Paetzold five decades before that dynamics is important. If someone like Halpern argued “Congratulations Dr. Kramm, you have discovered the stratosphere” I do not response. Because of my educational background Halpern’s argument can only be assessed as primitive and arrogant. Your educational background and your name calling are duly noted. The reason you gave to Marco deserves due diligence. In your reply to Marco, you failed to mention that you did not answer Science of Doom’s questions. In your reply to Marco, you failed to mention that these questions were directly related to your work. In your reply to Marco, you failed to mention that these questions were formulated in a neutral manner. Refusing to answer objective questions directly related to your work because of Eli’s remarks wonder why you’re here, and now remembeing your noble professors. Please bear in mind that invoking the preciousness of your time is defeated by your presence here. Because of my background as a ninja your argument can only be assessed as a bait and switch. If your time is so valuable, why are you wasting it here quoting the comments of someone, who hasn’t even commented here, on another blog? Just for clarity, could you tell us whether you believe that the atmospheric greenhouse effect violates any law of thermodynamics, and if you believe that G & T have convincingly shown this? there are many different explanations of the so-called atmospheric greenhouse effect. This clearly means that it is not a well-defined physical effect. Therefore, physical principles cannot be used to verify or to disprove this so-called atmospheric greenhouse effect. In the paper of Gerlich & Tscheuschner (2009), many of these arbitrary explanations of the so-called atmospheric greenhouse effect were discussed and disproved. In case of the explanation given by Stichel, the former Deputy Head of the German Physical Society (DPG) Gerlich & Tscheuschner showed that Stichel had described a perpetual motion machine of second kind. Such a motion machine would be possible if only the 1st law of thermodynamics is considered. But it can be disproved with the aid of the 2nd law of thermodynamics. In our paper “Scrutinizing the atmospheric greenhouse effect and its climatic impact” Ralph Dlugi and I did not consider the 2nd law of thermodynamics because it was not necessary to underline that both the explanation of by the American Meteorological Society (and the WMO) on the one hand and that by Ramanathan et al. (1987) on the other hand have to be discarded. From a physical point of view these two explanations are so different that we restricted ourselves to these two examples. We showed on the global energy budget for the entire earth-atmosphere system that the solar energy input into this system is balanced by the infrared radiation emitted to space. This means that no gain of energy in the entire earth-atmosphere system can be claimed by considering an obscure atmospheric greenhouse effect. Are you so stupid that you cannot use quotatrion marks? Or does your version of defence of the greenhouse theory reqiure outright fraud. You would be well advised to consult your co – author Joel Shore who admits that your confusion over the term ‘heat’ was a big mistake. The mistake that Joel highlights is only one of several in your now notorious ‘Gerlich-Tscheutschner comment paper’. Could you give us an example of this form of punctuation? Quotation marks such as “……” are used to indicate a direct quote. When Eli Halpern failed to use them he gave the impression that Fred Singer said something that he did not. TS it all depends on which version of greenhouse effect you believe in. The one that Eli Halpern promotes involves spontaneous heat transfer from a colder atmosphere to a warmer Earth surface. This version of the greenhouse gas theory is ignorant rubbish. Are these refugee sky dragons fro Curry’s? This is just pedantry. It’s obvious what Eli Rabett meant, and no one here needs examples of how to use quotation marks. Of course, he might have tried to use blockquote formatting, which doesn’t work here, but there’s no preview so you don’t find out until after you’ve left your reply, as I did earlier in this thread. If anyone is in any doubt about how confused Eli (and his disciples) are, they should follow the link. I sympathise with Andrew Judd patiently explaining the difference between radiation,energy,heat and work. However Eli and co are just as confused at the end as at the beginning. If Eli would ask Physicist Joel Shore (who Eli trusts) to read over his link I’m sure Joel would have to agree with Andrew. Would that cause Eli to admit he was wrong about heat spontaneously transferring from colder to higher temperature surfaces? It should, but then Eli is dedicated to some ’cause’ which certainly has nothing to do with science. Ah, you mean Eli’s co-author. If you can assign a positive temperature to the energy flow it is heat. True that is a bit more than you get in General Chemistry or Physics, but what the hell. Do you have a link to Singer saying that? Thanks, but I meant the criticism of G & T (& K). It’s very thoughtful of you.I’m happy to meet youMe too.I wonder if they can make itI was taking care of Sally.Linda speaks as if she were a boss.Guess what? Time is more valuable than money.Any day will do.You may choose whatever you like. I’m usually just using the search engines to look up information.What you need is just rest.Spring is a pretty season.Walking up and down the stairs would beat any exercise machine.Help yourself.The population of the city is close to a million.The population of the city is close to a million.What shall we do tonight? Keep it up!I think you have the Wrong number. along on cushioned feet, the only possible response is: ˜Of course. Hello! I’ve been reading your web site for a while now and finally got the bravery to go ahead and give you a shout out from Dallas Texas! Just wanted to say keep up the fantastic work! the best solution for your outdoor spaces.